00:15:00 Makes 12 servings, 1 cone (68 g) each. Makes 12 servings, 1 cone (68 g) each. These may not be ice cream cones, but they sure are delicious. Made with chocolate pudding and crushed cookies, these delightful desserts are fun to make and even more fun to eat! Beat pudding mix and milk in large bowl with whisk 2 min. Let stand 5 min. Stir in COOL WHIP and 3/4 cup crushed cookies. Refrigerate until ready to use. Spoon into ice cream cups just before serving. Sprinkle with remaining crushed cookies to resemble dirt in flower pots. Flatten tops slightly with back of spoon. Flatten 12 JET-PUFFED Marshmallows; press both sides of each marshmallow in coloured sugar. Use clean kitchen shears to make 5 (1/2-inch-long) cuts around edge of each marshmallow to resemble the petals of a flower. Cut 6 small gumdrops horizontally in half; place 1 gumdrop half, cut-side down, in centre of each marshmallow flower. Instead of spooning the pudding mixture into ice cream cones, spoon into resealable plastic bag instead. Seal bag, then diagonally snip off 1 corner from bottom of bag. 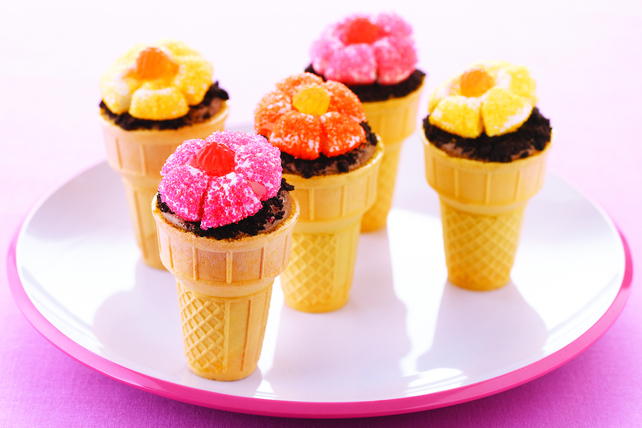 Squeeze pudding mixture from bag into ice cream cones, then decorate as directed. With their built-in portion control, these cones make great treats. Serving Size Makes 12 servings, 1 cone (68 g) each.